But, no. These are two of the fabrics from Lizzy House’s 1001 Peeps collection, which I bought when I first started quilting, and which I’ve been having a hard time getting myself to cut into. The My Precious QAL is brilliant: it got me to actually use the fabrics I bought because I like them, instead of just staring at them in the hopes that they’ll stay where they are forever! I’m pretty sure I didn’t buy them to have them gather dust, no matter how much the little grabby-hands part of me may disagree. 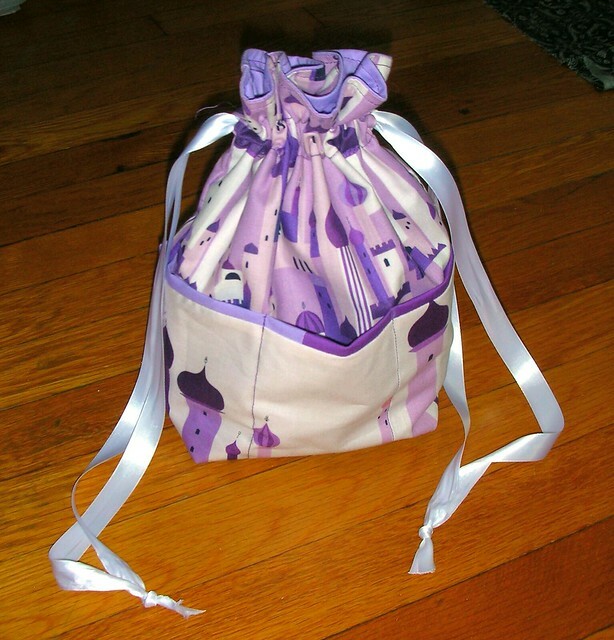 I like the ways the fabrics work together, and I’m probably going to end up making another bag from this pattern. This one is already on its way to a friend, and it was a lot of fun to put together. The pattern is by Jeni of In Color Order, and she posted recently about a modification to add pockets. Both sets of instructions were beautifully clear and easy to follow. In non-quilting news, knitting on the subway has netted me half a sock this week, going to and from classes (in Manhattan) and study sessions (in the Bronx), but that’s about all. I’m taking two Latin classes this summer, one in June (classical Latin) and one in July (medieval Latin), and this past week I’ve spent what feels like a lot of time studying for my Latin final exam, which is this evening. I just hope it’s enough. And hopefully the instructor will give us Cicero or Nepos, not Caesar. Wish me luck! That’s an adorable little bag! I’ve been eyeing the pattern for a while because I see so many cute versions of it around. Thanks! It was a lot of fun — I recommend it. It’s a very clear tutorial, and it makes a sweet little bag. I think if I were to make it without the pockets I’d probably iron on interfacing to the main fabric of the bag, though, to give it a little more body: without the pockets it’d be pretty floppy. The precious QAL was good for me too – I’m not sure what I was saving the fabrics for! 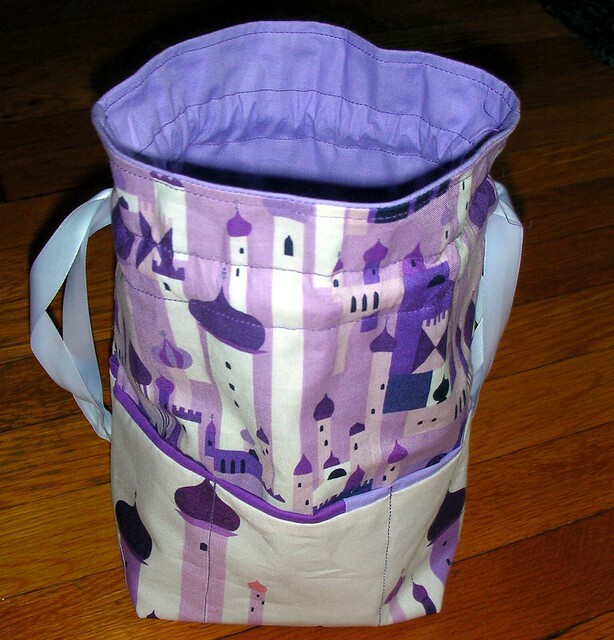 Your bag looks great with those fabrics! Thanks! I’m happy with it. I’m using some of the other 1001 Peeps fabrics for a quilt-along, and that’s been great, too. What did you make with yours? Previous Previous post: The Let’s Get Acquainted Blog Hop is going strong.